I am now officially in UK, staying at Trinity College, one of the oldest residence in Cambridge University, built in the mid-1500s and founded by Henri VIII. Famous scientists, mathematicians as well as numerous Nobel prize winners used to stay in Trinity, so it is quite wonderful to know that I am staying where the fundamental science has started. My body hasn't gotten used to the jet lag. So basically I am writing this post at 3 in the morning (10PM in Montreal time). I guess I have free up some time for food blogging. The past weeks, I have been practising my presentation for the conference in front of various groups of people, those who knows my research and those who doesn't. It gives a good indication on how well I am transmitting my key messages to the audience. The more practice, the more confident that I will be able to answer audience's questions. This is always nervous part of the presentation. You will never know what kind of trick questions that will be asked. The most terrifying moment is not able to answer the question properly. A while back, I made hummus, great for spreading on bread every morning, rarely I have time to make fancy breakfast in the morning. I create many variations of hummus so I won't get tired of eating hummus everyday. Try to blend some flavours, explore alternatives. For example, tahini paste has a silky texture and nutty flavour, why not substitute with peanut butter or raw coconut butter or even almond butter. If you like hummus, what flavours would you put in it? 1. 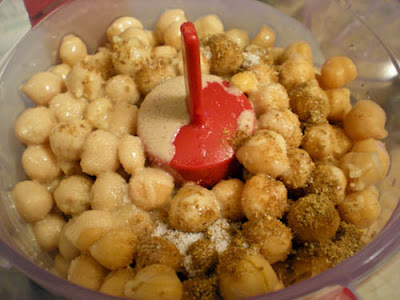 In a food processor, blend chickpeas, tahini, lemon juice, cumin, salt until smooth. 2. Add in garlic and apple. If necessary, add few tbsps of water if mixture is too thick. Blend in parsley. 3. For decoration, make a circular well on the hummus and drizzle with hummus. Place unblended chickpeas in the well. Nice presentation! I love hummus and I'm glad that I know have a recipe for it..thanks! Have a nice trip and good luck on your presentation. Your hummus looks tre noms. I love hummus. I make it almost every other day with some crazy variations. Welcome to the UK! I'll be sending you an email tomorrow when I got the confirmation from work. My favourite hummus is caramelised onions or with lemon and coriander, which I am currently snacking with pita chips and carrot batons. I love your ideas. Must break out of the mold. 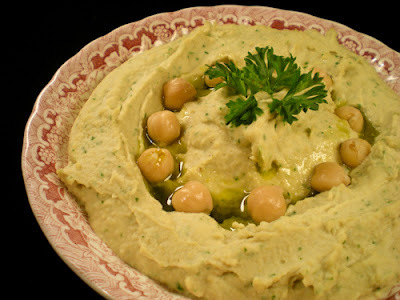 Love hummus as they are so versatile.. just taste great with almost anything :) Thanks for sharing! So earthy and decadent... Good luck on your presentation!! good luck for ur presentation! to be honest, i've never tasted hummus in my life, but this looks like a fabulous dish! Will have to try your version; Good luck; hope you are enjoying UK. Good luck with the presentation! I have not tried hummus before, but it looks good with some crackers. Thanks for sharing! Good luck with your presentation! I'm sure you'll do great! It's interesting that you used apple in your hummus. I've only made plain hummus with tahini, but I'd love to try roasted pepper hummus. How exciting for you to stay in that beautiful, old residence building! Good luck with your presentation too. I love hummus and make it much like your recipe only I roast several more garlic cloves for a nuttier flavor. I like the idea of the apple in yours. Your hummus looks great. Best of all, it's so easy to make - just load the ingredients in the food processor. I never thought of adding an apple to hummus! 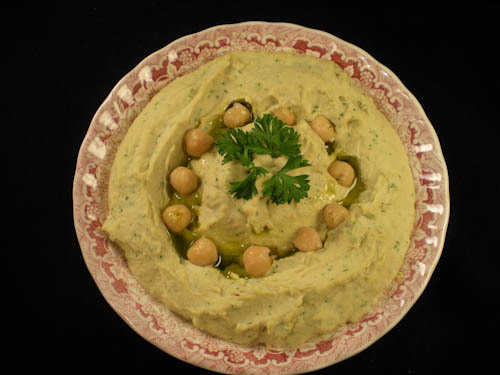 Victor, looks delicious - I love making hummus and will try this recipe next time! Great to meet you last Saturday, don't forget your travels around the UK! Thanks for the great tour around Stonehenge and Bath, it was educational and fun. Don't worry, I will talk about my UK travel soon. hi victor, how are you? wow, looks like you're staying in one of those prestigious places. That's wonderful to hear that. Good luck and wishing you well always! Looks great, but I usually like the parsley on top.